Watch for weekly updates throughout March, April and May and then daily updates once we begin our journey in mid-June. First to Washington, D.C. and then off to Normandy, France. Persistence is another word that came up again and again. Persistence by Eisenhower and the high command to keep pushing hard against Germany to avoid getting bogged down like what happened in WWI. The persistence of our soldiers who withstood barrages, offenses and strong defenses throughout their march towards Berlin is also important to recognize. The strategizing is done in the war room by generals but the fighting is done in the foxholes, cities and battlefields where soldiers have to put their all into it. There is also the persistence of the American people who are putting forth an immense war effort to supply and support our soldiers. Our final theme is that of morale—positive for the Allies and a downward spiral of negativity for the Germans. This is widespread throughout the ground troops but also amongst the leadership. Hitler’s distrust of his advisors makes it difficult for them to be confident in their advice. Many of them resort to investing more time into planning Hitler’s demise to redirect the war or end it altogether. German soldiers have fought hard, met the peak of victory and are now in their slow fade on both the eastern and western fronts. Meanwhile, our forces keep securing tough-fought victories that is fueled by leadership and the home front. By the way, this is Ron writing on behalf of Matti Martin and myself. She is fighting a cold while writing final papers, studying for final tests and completing college applications. Makes my preparations for taking 70 kids to D.C. next week, articles to write, videos to produce and photos to edit seem rather easy. Okay, maybe not but I wouldn’t trade places with her if I could. Both of us are VERY excited for the Institute. By the way…..you might want to give this touching speech a listen as well and share with your students if you are so inclined. I have this file as an mp3 if you prefer. Message me ronald.hustvedt@elkriver.k12.mn.us and I’ll send it to you (runs about 12 minutes). -- What was the mission of the airborne on D-Day? Why were their missions important? -- British Brigadier James Hill told his troops “do not be daunted if chaos reigns. It undoubtedly will.” (55) What role did chaos and confusion play in the airborne drops? -- What were the key factors in the success of the Allied airborne on D-Day? -- British Air Marshal Leigh-Mallory was afraid the airborne troops would be slaughtered and he begged Eisenhower to cancel the drop. If the drops had been canceled, how might D-Day have been different? What were the key factors in the success of the Allied airborne on D-Day? Preparation, intelligence, training, air/water superiority, and luck are the key factors in the success of the Allied airborne on D-Day. Even with such an extensive list, success in the invasion was hardly a pre-determined outcome. Every ground soldier on up to Eisenhower knew that success would not be known for weeks after D-Day but that failure would probably come relatively soon and would have harsher consequences. It would be possible to win the first phase of the battle only to lose it later. The preparation in throughly training soldiers, even if it didn’t always work out, so they’d be able to focus on the situation rather than their actions. Intelligence was amazing, as we’ve discussed before, and the Allied maps showing soldiers so much more than the Germans expected them to know. It is also worth noting that these soldiers of the 101st, 82nd and others were highly trained, specialized soldiers who were strongly conditioned and given a lot of preparation. The Germans they were fighting were well seasoned, but their ferocity was subdued even if their lethality was finely tuned. Had a European invasion taken place earlier, the Allies lacked enough superiority in the air and sea—troops would have been more susceptible to hostile fire and paratroopers might not have even been used for their primary objective–secure the peninsula and go after German guns/armor that would be used to repel the invasion. The paratroopers were the flank to the amphibious front. My final factor is luck, specifically dumb luck and, especially, good luck. All the variables in the world can stack against you and while it’s true you make your own luck, bad things happen to good plans and Eisenhower knew that and felt it more than anybody. British Brigadier James Hill told his troops “do not be daunted if chaos reigns. It undoubtedly will.” (55) What role did chaos and confusion play in the airborne drops? Part of me wants to say that chaos and confusion was the role of the airborne drops. To the German forces on the ground, the transition in a few hours from a peninsula devoid of British and Americans, to one literally crawling with them was indicative of a change in the works. It was not meant for the drops to be all over the place, but because of the chaos that reigned in the air that night, that’s how it worked out. “Another airborne officer, however, observed that the unintended dispersal of units during the chaotic drop had proved an unexpected advantage in one way: ‘The Germans thought we were all over creation.’” (p. 66). The British and American troops were well trained, they were mostly well equipped with the major deficiencies coming because of the chaos during the drops with lost equipment. A lot of paratroopers/gliders lost their lives that night and in the days to come because of the chaos and confusion, but I believe the benefits outweigh the liabilities from a long-range standpoint. I’ve made this point before and I’ll make it again–when soldiers know how to problem solve, when they know how to work together to overcome adversity, when they know how to conduct business on their own as well as they know how to follow orders you have a solid unit. Ambrose’s words about democracies making excellent armies comes to mind. Chaos and confusion are the name of the game in a system of government like a democracy/republic. This is the system in which these soldiers grew up and it prepared them, as did living through the depression, for having to shift on the fly and play the cards they were dealt rather than the ones they wanted. Chaos and confusion are usually words we typically associate with their negative connotations but when one looks at the airborne drops, it is chaos and confusion that proved to be the key to success. The scattering of troops that night created chaos, it was literally raining men! The complete 180 degree flip flop from a country void of British and Americans to one crawling with them created an aura of utter chaos. While for some soldiers the inability for things to go as planned lead to their untimely deaths one cannot help but see the advantage that the chaos allowed the allies to obtain. Another way to visualize this is when you are playing dodge ball, when it’s us versus them in a straight line and you can see what’s going on you are much better able to function and it is truly a match of skill. But if you were playing dodge ball and suddenly people started falling from the rafters, coming in the side doors and up through the floor boards, well then you might be able to understand how the Germans felt. The key factors that made the Allied airborne invasion on D-Day success really come down to a person to person basis. One can look at the broad terms and say that it was the intense training and preparation that prepared the soldiers and the strategies laid forth by the Generals that allowed for a successful invasion but the fact of the matter is it is each soldier that allowed for the success. When you are fighting in the midst of absolute chaos, dropped miles from your intended drop sight no amount of training and strategy plans is going to determine how well you do. The deciding factors therefore were sheer luck and the way individual soldiers responded to the adverse conditions. Consider the reality of the young men who were "getting ready" to launch this invasion. What is their emotional state? Can you connect this to another experience or historical event? It would be absolutely nerve-racking to go through this experience of waiting, training, and trying not to think about what all the waiting and training was really all about. I would imagine that there would be an extreme sense of urgency to just get on with it and get over it, but impending doom is also something easy to try and put off. I think the emotional state of each man depends on his personality, his life situation, his age and his disposition with the other men. Because the vast majority of them are young men, I think that it still has the feeling of being an adventure. The distractions of youth are all around in England including the excesses of youth. Still, whether angry or depressed, eager or fearful, the state of purgatory is not an easy one to sit through. Connecting this to another experience or historical event is tough to do because of the circumstances. On a superficial level, it's just like men in most every war prior and most wars since. A state of waiting just goes with the territory in preparing for war. In each case the age of the men is similar, distractions exist, preparations occupy the time, emotions are all over the board. The closest thing I can think of this being like is the experience of a good friend who battled brain cancer for three years before it finally took his life. The seizure he had that made the problem apparent was like his own version of Pearl Harbor. A previously unknown problem suddenly came up and the enemy was then identified. An assessment of resources was taken, plans made for attack, and then he proceeded to receive treatment. The tumor was operated on, irradiated, shrunk and blasted with chemo but it still remained. Each new treatment had the same pattern: learn about it, learn the risks, spend time considering it, make the appointment and then wait for that date to come. The period of time from making the appointment to showing up for the appointment is probably what it felt like for the soldiers pre-D-Day. You know that this could be the end, you feel prepared but for what you aren't sure so how do you handle it? Live like life is almost over? Live like life is going to have another chance? Seeing it was not easy because there was nothing that could be done except for help from the sideline. I'd believe that the experiences of me and most of his friends was similar to those of soldiers' loved ones. Focus on preparation and support knowing that the final battles are out of your control and not your fight to make. Matti's Response--A slightly different prompt than the teacher prompt this week....you'll see that first then Matti's response to it. Discipline can be defined many different ways; “training to act in accordance with rules “ , “activity, exercise, or a regimen that develops or improves a skill; training” , “punishment inflicted by way of correction and training.” In both of the readings from this week multiple examples exist for each of these definitions. The intense discipline involved in the preparation of Operation Overlord is much more than the standard idea we have of “military discipline” or organization. The soldiers themselves experienced first hand multiple forms of discipline. They were expected to follow orders to the nth degree and even when small things such as failure to inspect the latrine occurred, harsh reparations often followed. Yet this discipline was not always bad, when describing his first encounter with tanks in Band of Brothers, Webster hinted at how had it not been for the discipline he had encountered he would have quite possibly been squashed by a tank. Another example of the theme of discipline can be seen in the precautions taken by the government officials. The strict secrecy through censored letters, and cover ups of incidents such as that at Slapton Sands shows extreme discipline. Not only was every outgoing letter read and censored but every letter leaving the US as well, in addition to the fact men of the 4th Division Infantry were not even permitted to speak to cooks shows just how committed all parties involved were to war effort. Discipline in all of these situations is crucial because when everything hits the fan and everything is happening for real, it is discipline that will hold a unit together. When the time to live or die comes, it is those who are prepared, who have trained and who show discipline that ultimately come out on top. Discipline allows you to function when everything else is crumbling. The brass knew that Normandy was going to be a blood bath and weren’t entirely sure it would be successful. Troops had to be disciplined to tough it out no matter what, to reorganize and problem solve no matter what and to maintain order when it was not clear who their commander was after all the officers were dead. Had it not been for the extreme discipline, there is no certainty that the landing could have been achieved. For week 8, please analyze what you think were the two most important factors in preparing for D-Day. This was the largest amphibious invasion in the history of the world, and planning was at least half the battle. 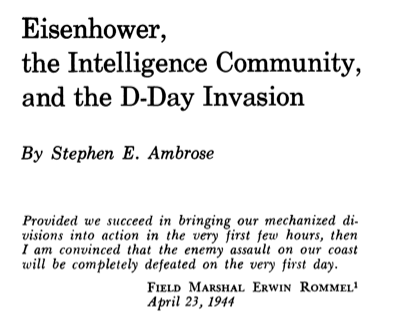 Stephen Ambrose, "Eisenhower, the Intelligence Community, and the D-Day Invasion"
What were the two most important factors in preparing for D-Day? It is a question that one can look at through many different layers. I'm having a hard time pinning down two factors because of the issue of magnitude. On an individual level, I feel that the leadership of Eisenhower definitely ranks right up there at the top of the list. His ability to be a decisive leader while also a very democratic one is something that makes him one of the best generals ever in the history of the world, in my opinion. I enjoy the writing of historian Stephen Ambrose and in one of his books he talks about how democracies are capable of producing great armies. I believe that Eisenhower's leadership enabled this to take place and his leadership allowed many other factors to become part of the successful invasion. This is inline with the question because there is a tremendous amount of research out there that shows that teaching methods, tools and resources are important, but none so much as the actual teacher in that classroom. We are the Eisenhower's of our student's successes and failures because we marshal the resources and allocate them as we see fit, but I'm willing to go out on a limb that each one of you reading this also has a relatively democratic classroom where the students are not merely subjects to your rule, but partners in the process of learning. Great soldiers are scarce but more prevalent with great leadership. Great students can exist on their own, but great teachers create an atmosphere where everybody elevates beyond their "expected" level of success. I spent so much space arguing for Eisenhower and the troops that I'm not sure how to layout the rest of my point. Intelligence and industrial might are the other two most important factors that led to the success of D-Day, Overlord, and the victory in Europe. I'm going to try and tap dance down the middle and the only way to do that is to declare "alliance" as the second most important factor. As our readings pointed out, the industrial might of the United States made our soldiers the best equipped on the battlefield. Not just each individual soldier, but the entire logistical support system he had behind him. Supplies, medicine and rations were prevalent thanks to the U.S. industrial might. Most of that might just have laid waste in the sea, however, if not for an absolute triumph by British intelligence. Keeping the Germans guessing, exploiting their poorly structured military chain of command, and being the puppet master of German intelligence was a decisive move that reduced the number of question marks for Allied leadership. Might in both is rarely achieved and, in reality, neither the British or the Americans possessed it all until they were in complete alliance with one another. The two nations have always had a special relationship with one another but it's been one long dominated by mistrust. That mistrust still existed in WWII, let's not get over-romanticized here, but the ability to trust and keep the bigger picture in mind helped this alliance survive the stresses of war, ego and self-interest. The alliance was essentially a transfer of "superpower" status from the British to the Americans, but I believe that, at the time, both nation had the ideal balance of confidence and humility that enabled it to work so strongly together. Had that not existed, and had those demons of ego, stress and selfishness dominated, the alliance would have looked more like the one that existed between the Axis leaders. Planning on both sides of the war can be considered the two most important factors in the success of D-Day. The German’s knew an attack was coming and planned as they saw necessary. This entailed placing troops up and down the coast of France. Hitler was afraid to combine all of his forces in to one area due to his fear that if all combined forces were one area they could be over run. Therefore the French coast was littered with smaller forces than would be necessary to stop the Allied Invasion. The Allies as well put much thought into their planning. The generals planned the most ornate and elaborate amphibious, the biggest of the time. They held the invasion during a storm and attacked not at the expected location but instead on the coast of Normandy. The generals were able not only to plan key military strategy by planning the invasion in levels of bombings and attacks but were able to incorporate the element of surprise. The combination of these plannings, ultimately were the two key factors in the success of D-Day. This week we are returning home to look at the impacts of the war on the civilian population. This is important to understand the full picture of the story and to remind us that World War II had a profound impact on the world, not just the military. 1. What are some of the ways that women saw drastic changes during the war? What role did they play in the wartime economy? How did the wartime economy impact them? Women probably were the group that saw the most drastic changes during the war of any group in the United States, as well as around the world. With so many men off and fighting or supporting the war, the women were called upon to keep the factories rolling and supply the war. The United States pushed the Allies to win WWII because of our massive ability to supply the troops with weapons and supplies. The industrialized processes were hard at work and women provided much of the labor needed for this massive production effort. From the accounts in Terkel’s book as well as other accounts I’ve read, most of the women didn’t realize what was changing at the time. When they look back upon it they realize they felt an awareness, but when everything is flipped on its head you don’t know if it’s something different on a permanent basis or just temporary. Women suddenly were making their own incomes and they were incomes you could live off of, not just supplementary farm work. Women purchased items needed for their lifestyle and the survival of their families, but many also had disposable income enough for purchasing additional items. This set the scene for a post-war boom in consumerism and also gave women a reason to continue working once the war was over. When I teach this to my students, they always say it’s like a genie you let out of the bottle and can’t put it back. Men kept women out of the workplace for so long saying that they didn’t need to work, and once women got to work and earn their own paycheck—once they got to do work that was more than just chores-they discovered new freedoms and economic power that they would not easily give up on no matter how much people wanted things to go back to how they were before the war. The wartime economy fundamentally impacted the role of women in society and provided them the experience to see what a more gender equal world looked like fueling the feminist movement of the 50s, 60s and 70s. 2. In what ways were children and teenagers involved in the war effort? How did it impact their daily lives? It must have been very interesting to be a child or a teenager during the war because of the unique perspective of age not to mention the various ways in which you interpreted the information given to you. Watching the news reels at the movies of the war would have made it seem glorious and like something you wanted to go and participate in once you were old enough. It also would have inspired a lot of the home front efforts kids and teens were a part of including collecting scrap metal, household supplies and helping Mom manage the rationing coupons. Children and teens are very good at seeing through the B.S. spewed forth by adults as well and I found it very interesting to read the account of Mike Royko about how men and women were treated who were not off fighting. He spoke about what he saw from the perspective of an adult, but it was based on his childhood experiences and the things that stuck out in his mind. He was very tuned in to the social pressures put upon men and women stuck at home and how adults maintained social order in a time of extreme stress. Older teens often were called upon to work in factories or take care of younger siblings while their Moms went off to work. I don’t think that children and teens of the 1940s really saw the war as drastically impacting their life at the time, only as they look back. The Minnesota Historical Society has a great display on “The Greatest Generation” and so many of the accounts written by adults, thinking back to that time period, was that they didn’t know life any different so it didn’t seem weird to them until later on once they saw life without the war. 2. Peggy Terry said that World War II “gave a lot of people jobs. It led them to expect more than they had before” (112). What do you think these women’s expectations were? To what extend were they realized during and after the war? I think that women, many of them for the first times in their lives, finally began to see themselves as useful. They had a job, just like their husbands, they were good at them, they brought home money and still managed to put a decent dinner on the table. In the workplace, even if conditions were terrible, there was some form of respect for them. No longer would they need to be the subservient creatures of society, they could do it on their own and they for the first time experienced the feeling of being independent. These women once they had a taste, grew to expect this feeling of independence. They wanted to feel secure that if anything ever happened be it divorce, death or a war they wanted to be able to bread on the table and they began to expect they would always be able to. After the war women were expected to “go back to the kitchen”. Many women did but many of them did not. These expectations helped many women to fuel the coming women’s rights movement but for those who went back to their domestic work often found their psychological and daily expectations of being independent were not met. 2. Stalingrad is the turning point on the Eastern Front. Why would a military commander try to avoid fighting in a city like this one? Urban combat is one of the most difficult undertakings of a military using traditional tactics because those tactics were designed for field warfare. In an urban setting, there are an infinite number of bunkers, shelters, ambush points along with numerous elevated positions. It’s much easier to defend a city than it is to conquer a city, however, and the people of Stalingrad proved this to be the case. As Stokesbury puts it, ““City fighting is a nightmare for troops and commanders alike; for the troops all the skills developed in open country are negated. The need for constant alertness saps vitality, and even perpetual caution is not proof against sudden surprise, the sniper, the mine, the booby-trap, the man who leaps around the corner and shoots first, the grenade that comes sailing in out of nowhere. Commanders lose control of their battles and watch their forces disappear into a choked mess that defies description.” Something that made Stalingrad especially difficult was the fact that it was laid out along several rivers with numerous natural features preventing a solid attack. The surrounding countryside also proved to bring problems for the Germans. 3. In hindsight, an Allied victory looks inevitable. The production capabilities, the manpower, and the geographic locations of the Allies proved too much for the goals of the Axis Powers. Yet we know that history is not inevitable. Choices play a role. Choices in policy, choices in military strategy, and choices in industry all played a role in reaching the “equilibrium” of late-1942. What three choices by any of the individuals we have read about so far have helped bring us to this point? Explain. I think an Axis defeat looks inevitable but an Allied victory is not necessarily the case. As we have seen in modern times, and throughout history, defeat is easier to achieve than victory and it still astonishes me that after all those civilian deaths, after all that animosity and intense bloodshed, the leading nations of World War II can sit down and have a guarded peace with one another. I think that the only one who holds the title for “impactful choices” has to be Adolf Hitler. His bumbling on the German side with logistics, military movements and domestic work clearly led to the defeat of the Axis powers. Numerous tactical errors made during the assaults on Moscow and Stalingrad stick out in my mind as turning the tide of the war. The Soviets were on their heels as Hitler drove east but then held back at considerable cost to both sides. Similarly, Hitler’s inability to trust his senior generals and pure ego that forced him to micromanage every situation, was a choice that led to this tilt in the equilibrium. As a civilian leader, Hitler should have stuck with these affairs because then he might not have made his third and, in my opinion, his most crucial mistake in shifting the tide of the ear. A lack of long-term economic development in a time of economic stress and, potentially, economic strength, reflects poor leadership and foresight. Hitler clearly did not foresee the war lasting as long as it did otherwise why would he have not been prepared to keep it well supplied. Speaks to a lot of elements of the human psyche. Why does it seem like the Americans are always up to this? I know I have a tendency to try and find a silver bullet, in the absence of one I keep working. Fighting in a city is like throwing a tennis ball at your sibling in car, if you get lucky you hit them, if not it could come right back in your face bouncing off of everything in sight. There are many reasons why military officers avoid fighting in places such as Stalingrad. Firstly Stalingrad was a major industrial city. Being a major city meant that not only would there be countless soldiers stationed there to protect it but that they would be well supplied given the city’s ability to readily create weapons, ammunitions etc… Secondly the location of Stalingrad atop a hill made attacking the city more difficult given the fact that it’s not only harder to run up a hill but that it is easier to shoot down one as well. The Russian military also had the upper hand given the fact that they were familiar with the location, if your sneaking around corners with your life on the line it helps if you know where you’re going. The overall savage nature of the Eastern front at this time is another reason why generals would want to avoid battles such as Stalingrad. When the army you are facing is not afraid of carnage, the people are throwing grenades out of windows and you know you are outnumbered from the very beginning there is very much a reason to be concerned. While there are many successful decisions made by Allied personnel one could argue got us to the point of equilibrium thus far in the war there are three distinct poor decisions that helped to get us there. These poor decisions none the less were made by Hitler, the first of which being his poor decision in strategy when it came to the Battle of Britain. The Battle of Britain is often argued as what could have been the end of the war all together, the French had for the most part been dealt with and all that remained was the need to deal with Britain. Had Hitler achieved victory here the entire conflict might have been settled thus never allowing us to reach the equilibrium point we have reached in our research thus far. Another poor decision by Hitler was the decision to invade Russia. Two front wars historically (especially for the Germans) don’t end well. The attacking of Russia in and of itself was an optimistic idea in the first place, but to do so when another front was active in the west was a terrible strategic blunder. However it was this blunder that allowed for the spreading out of German forces and was a major contributor to the capping off ( and eventual decline) of the German empire. The third blunder that Hitler made was the decision to declare war on the United States just after Pearl Harbor. The US might have eventually declared war on Hitler but declaring war on them was essentially inviting them to come fight the Germans when they already were busy with a two front war. Had Hitler not declared war it is arguable that the US might have been more focused on the Pacific theater but the US’s direct involvement in the European theater would largely aid in the reaching of the equilibrium point we are currently discussing. Our focus this week is adjusting to the military lifestyle (or not). The military was a very foreign experience for many WWII Americans. Please choose two questions to respond so. 3. Over 16 million Americans served in the military during WWII. Who were they? The over 16 million Americans who served in World War II truly were a cross-section of the United States population. Some of them were young men (boys) who were off for the glory and adventure they felt war would bring them while others went with nothing but a sense of dread for what they felt was an impending doom. Some tried hard to avoid serving and were compelled to do so while others went with a conviction that the best way to survive a war was to be the best and surround yourself with the best. We don’t like to talk about those who were less than bold. We don’t want to believe that people hated to be there and hated it the whole time. War stories are often about triumph, whether accidental or intentional. We all know from real life that triumph is not always the case. Even within a winning campaign there are many stories that are less than glorious. I know that as Matti and I were examining soldiers for her project we wanted somebody with a “good story.” I found it rather striking that several soldiers had less than spectacular stories. There was a Silver Star recipient that had some of his fellow soldiers refuting the award many years later because act was one of stupidity they felt rather than one of bravery. There was also a General (the highest ranking officer in the Normandy cemetery) who was killed by friendly fire and had recently had his leadership questioned for his poorly executed tactics during the campaigns in Africa. After I read the first two chapters of Band of Brothers I had the urge to watch the first episode of the HBO series again. I ended up watching the first three episodes. I am always struck by the vast variety of characters portrayed in the series. I am also struck by the randomness at which soldiers are killed. Bad luck, dumb luck, good luck seem to determine who makes it through and who doesn’t. That sheer randomness is why I think veterans talk about the true heroes being the ones who didn’t get to come home. You experience all of that and come out alive while the guy next to you doesn’t and you can’t explain what you did differently than he did. 4. Military training was about more than just learning a job. What else did soldiers learn in training? Were these lessons important? I tell this to students when we are in class and during big projects—it’s not end project but the process to get there that you’ll most learn from in the end. It’s another take on the “It’s the journey, not the destination” philosophy which is true with our experiences and true with the overall experience of life. Military training in general, but especially in a time of war, is about very intense experiences in a short period of time. There are a lot of opportunities for learning at every step along the way and those who learn the wide variety of lessons fast survive while those who cannot adjust do not make it through training. The soldiers of Easy Company learn all the skills of being a paratrooper but they also learn about getting the most out of themselves mentally and physically. Something else they learn is that leadership, while it must be followed, it is not always something you can believe in. While that’s a cynical view, I think it brings soldiers the lesson that there are not always easy to identify principles that you are fighting for. The big picture can get lost when the immediate picture is clouded. When you are around such a diverse group of people with all sorts of different experiences a lot of lessons about values, acceptance, compliance and social expectations come out. Add the pressure valve of war and those lessons are not only magnified but they are contorted. Rather than giving you specific questions this week, make a connection between the three readings. Stokesbury gives an overview of the Japanese attack (including Japan’s motivations) and the damage it caused to the U. S. Pacific Fleet. Studs Terkel introduces some Americans on the West Coast who felt the impact of internment and experience the chaos in the days following the attack. Then Alex Kershaw take things to Bedford, Virginia to introduce a set of ordinary young men who face extraordinary circumstances. Choose an idea, theme, or thought to link the readings together. I have always felt a connection to World War II and especially the Japanese attack on Pearl Harbor because I was born on December 7th. Granted it was 33 years after the actual attack, it was close enough for many people that I always heard a lot about it growing up. As soon as I could read about it, I began researching the events of WWII. My great aunt was a nurse who served in England, lost her paratrooper boyfriend in 1944, and brought a German Mauser rifle home with her given by a soldier who took it from a German officer. Enough about me. One of the connections I made between our readings for this week, and has been an underlying theme in other Stokesbury chapters, is the state of preparation the United States was in prior to the attacks. Our nation was embroiled in a political debate prior to December 7 and the confusion caused by that debate led most to prefer inaction over making too aggressive an action. Every generation has its doves and hawks, and they don’t always hold true to specific political preferences because they exist for different reasons. In the Pacific, we were an Imperial force that was much like many of our young soldiers—well trained and well armed but little actual experience in the real world. In the Atlantic, we were much more at home but so gun shy from WWI that we sat on our hands rather than took decisive action. There were experts and leaders who knew what to do, but it was hardly a consensus and nobody had the political will or was willing to expend the political capital it would take for advanced action. But I digress, the will of the people was not there before December 7 and that date served as a great waking point in history. Another related theme each of the readings had in common was the lack of knowledge and information possessed by leaders as well as the people. Living in the “information age” this is much more apparent but while commanders were making often ill-informed decisions in the field, people on the home front were confronted with ill-informed decisions of their own. MacArthur was ill-informed in the Philippines leading to his retreat and the Western Defense Command was ill-informed of the actual threat leading to the internment of Japanese Americans. The Japanese were ill-informed of the American spirit of ingenuity and people of the United States were ill-informed of the Japanese character. One more rambling theme to discuss is the issue of motivation. Italy, Germany and Japan each achieved tremendous success and victories early on in their campaigns because they had a goal in mind and they set for it. Each of those goals unraveled for their own multiple reasons, but when they were rolling on they were prepared and focused. The wishy-washy policies of the democracies prior to attack, followed by the slow-turning juggernaut of democratic governance (even with tremendous power given to the executive), allowed for the offensives to be successful for a time, but once the juggernauts were turned and more focused, they proved to be the most formidable of war machines. I’m not sure if that translates to a maxim on life but I can’t help but think it does. War is not just a question of who did what first. It’s not black, white cut and dry the way most textbooks will have you believe it is. War is a muddled shade of grey, a shade which can force a nation into bereavement or unify its broken heart. War is an instance where as much as one would have you believe it’s all about the politicians, the military, and the strategies, it’s just not. War is not something you can just put on a paper as a stat; it’s not something that only affects a patriotic few. War is convoluted, confused and complex. Simply put, War is human. When the Japanese bombed Pearl Harbor the reaction in America was fear; black outs, people running in the streets, cowering in terror on their couch because the Golden Gate Bridge was going to be hit too. This reaction some could say was expected amongst the confusion, but as the dust settled the tensions did not. Studs Terkel’s book “The Good War” blatantly exposes this idea of war being a human phenomenon. His heart wrenching anecdotes describing the hysteria present after Pearl Harbor show the reader how while we all have read that people were scared, the reality was something much harsher. The human element of fear drove a country to create internment camps and separate mother from child based sole on ethnicity. This human element, from the perspective of the soldiers, is discussed not only by Terkel but by Kershaw as well. Kershaw when describing the soldiers’ reaction to the news not only highlights the perceived façade of a quick war, but the fact that many men didn’t want to go to war. Most of the Bedford boys had enlisted to avoid the depression, not to go to war. How can one look at a text book and measure that? How can you put yourself in the shoes of those young men, angry at the “dirty japs” drinking whiskey almost on a daily basis to cope with the horror and not classify war as human? Stokesbury too hints at this idea of a human aspect to the war. While much more technical in his delivery Stokesbury makes comments that provide a better rounded perception of the human aspect of war. Stokesbury when describing the Japanese in both this chapter and chapters prior the author describes the Japanese is such a way one can’t help notice their frustrations. The European powers keep yelling at them for trying to build an empire in Manchuria and China, when the nations themselves all have large empires over similar conquered peoples. That national sense of wrong doing Stokesbury almost uses as reasoning behind the bombing of Pearl Harbor all together. The Basic component that is war as taught by a text book could never describe to you in any justifiable way the impact on the war that human reactions and emotions had. It is for this reason, not only, can a central theme in these three books of war being human in nature, be established, but in the entire direction that would follow as a result of this human aspect to war. 1. We start to see the role that innovations plays in WWII in this section. Discuss instances where science, technology, and general innovation played a key role. With the industrial revolution in full swing throughout the leading nations involved in WWII, the knowledge and the tools existed by all to adjust and adapt to a changing battlefield. Each side was well equipped to exert their experience with the engineering process of innovation to out do the other side no matter what they created. One of my students, who has been researching the history of airplanes, showed me a quote basically saying that World War II started with biplanes and ended with jets. Nothing gets the creative juices flowing like war I guess and the desire to destroy and defend rather than be destroyed. The magnetic mine used by the Germans is a classic example. It was very effective for the Germans until the British got ahold of one and reverse-engineered an effective and relatively inexpensive countermeasure. The war at sea fueled a tremendous amount of innovation on both the tactical level and the tool level. Throughout the war, the British, Germans and United States modified their tactics in the Atlantic. The British reaction to the submarine was the convoy system, an innovative way of handling submarine attacks with armed escorts. The British also developed the Q-Ship as an innovation against submarine attacks. The use of airplanes, the German’s modifications to their submarines and shifting tactics by both sides greatly advanced this form of warfare. Anti-aircraft submarines, acoustic torpedos, and snorkel breathing tools are among the innovations created in a naval war that wrecked great losses to all sides. As Stokesbury outlines, “More than 2,600 ships were sunk, totaling over 15,000,000 tons. The British alone lost about 30,000 sailors of the Royal Navy, and 30,000 of the merchant service. The Germans built 1,162 U-boats during the course of the war; 785 of them were sunk, 156 surrendered at the end of the war, and the rest were either scuttled or otherwise destroyed. Almost 41,000 men served in the U-boats; 5,000 were taken prisoner, and 28,000 were killed” (p. 131). While science, technology and the spirit of innovation have brought us great things in the world, they have also brought us powerful means of being destructive. The desire to innovate seems to be stoked to higher levels at times of war. This is not just true in WWII, it’s been true for as long as people have fought. Many of our modern conveniences were conceived from these efforts and it’s a sad statement to our human priorities. It seems that our innovative spirit is fueled more to survive through violence rather than to thrive in peace. Something that resonated me even before reading a page of madame Osmont’s diary was the introduction by John Keegan where he states, “Her diary leaves us with a record for which there is no equivalent for the battle of Normandy, and very few from the whole history of warfare.” Keegan goes on to share significant battles where a civilian account, near the middle ground that always exists before great battles, would be a luxury item if it existed. Too often the civilians in just such an area are drawn into what’s going on or pushed out and almost certainly don’t have the time or wherewithal to keep a journal. I think the nature of the occupation of France and the separation across a waterway from the invading force made her journal more possible. The stresses, the fears, the extreme conditions do come through in her diary and really do show how impressive an account this is that it exists at all. The question I’ll focus on is about the desire for the French to exist and how I might react in a similar situation. It is quite easy to say that one would involve themselves in the resistance movement but quite another to run those very risks in the process. To that end, I believe that madame Osmont is exerting a form of resistance to occupation due to her insistence of leaving her things as they are and working with the occupying troops but also maintaining a distance. She stands up to them, she learns how to manipulate them and she keeps an eye on them. She also listens to them and is civil with them so as to gain their trust and protection when it is warranted. This is certainly not active resistance made to halt the German war machine, but it is a passive resistance that exerts ones humanity and allows one to survive when the alternatives are so grim. She is aware of her limitations, she is hoping to keep her home and property mostly intact and she would like to see her community survive relatively unscathed. She knows that she has no control over this so follows the sage advice of keeping friends close and enemies closer. As if she has a choice, with them patrolling around her home, using her farm and sometimes her home. Nonetheless, she so far has kept herself out of trouble while also becoming more bold with her resistance. 1. The French have a proud and storied history. Seeing the German army occupy their country could not have been easy. A desire by the French to resist was present. The consequences for resisting were serious and immediate. In that situation, how do you think you would react? To be honest I don’t know that I could actively resist even though my mind insists that it is the most noble and courageous thing to do. Yet I think I would be so afraid of the gruesome consequences that I would just cave to the demands and try to just wait the war out “ under the radar ” so to speak. If any resistance were to come from me I think it would most likely be in the form of passive resistance, things such as pretending to be stupid and performing tasks at a slow pace. Otherwise I imagine myself as possibly trying to befriend some of the soldiers less content with their duties and trying to convince them to keep the other soldiers away from my property. However given my nature I do not believe I could actively resist the demands by the German military as a French citizen facing occupation. 2. We start to see the role that innovation plays in WWII in this section. Discuss some instances where science, technology, and general innovation played a key role. In World War II the question of who was the best could no longer be determined by size or morale, it could only be determined by who had the best technology. Advancements in several fields changed the nature and tactics of war thus playing a key role in the direction the war would take and the impact it would have on those involved in war. Examples of this can be seen directly from events that took place during the war such as the leap frog like game played between the British and the Germans over submarine warfare. The Germans had created better submarines so the British developed better air craft carriers to counter this. The Germans then developed magnetically charged mines to sink the equally charged British ships and the British in turn developed a method of demagnetizing called degaussing to remove the charge from their ships, countering the Germans. Other innovations such as sonar, radar and new ways to send and intercept messages revolutionized the communications of war and played a central role in the way various operations were handled. The industrial technology side of the war also played a key role in the direction the war would take due to the need for better faster ways for countries to produce new machines. There is an excellent quote on page 20: “Happy are the dead who do not have to see this sad thing.” Is she talking only about trees? On page 20 when Osmont states “Happy are the dead who do not have to see this sad thing” Osmont is not only referring to trees but something much deeper. It can be inferred that Osmont is secretly expressing her wish to be among the dead things and not have to experience the horrors the war is inflicting upon all that surrounds her. It can also be assumed she is expressing jealousy towards her late husband who doesn’t have to experience the loneliness, fear and sadness Osmont is subjected to. Osmont sees these trees being unfairly cut down as an expense of the war in much the same way she sees her entire country and way of life being cut down and written off simply as an expense of war. 1. To what extent did the realities of democracy slow or stop the ability of France and Great Britain to halt the German blitzkrieg into Poland in the fall of 1939? The wheels of democracy move slowly, especially compared to the wheels of dictatorship and totalitarianism. Add in a militaristic viewpoint of the world and a very reserved approach to policing “rogue” actions and you create the very situation that took place at the onset of World War II. I was very interested to read about the reluctance of French and British military leaders and their vastly distorted estimations of allied versus German might. Stokesbury basically is contending that WWII could have been avoided if British and French military leaders had a more accurate sense of reality. “There is virtually no doubt that had [Britain and France] attacked vigorously, they could have broken through the thin screen of Germans to and across the Rhine. They could, and should, have easily defeated Germany, and the second World War would have never gotten off the ground.” (p. 75) The finger points more at the politicians, and rightly so, of those countries who were more than happy to accept the answer their generals gave them. In a democracy the military reports to the representatives of the people and while their answers are not supposed to be political, the politicians make it that way in their questioning and focus. It was very convenient to not entertain the possibility of taking decisive action in support of an ally against a force that was not prepared to a concerted effort. At least by Stokesbury’s accounts, and I thought he laid the argument out quite convincingly, WWII was avoidable even after September 1, 1939 if the wheels of Democracy worked a bit faster and less cautious. Actually, not even less cautiously, just plain scared of another war of any magnitude. What they ended up with was a war that shifted the power structure of the world for at least the next century. For the record, while I don’t disagree with Stokesbury’s conclusions, I feel he takes too strong of a stance on this. His argument is well supported but overly simplistic with too many “what-ifs” left hanging for my preference. I’m sure he could convince me, but for now I’m a skeptic. 5. How did the people of Great Britain respond to the air raids? In what ways was it Britain’s “finest hour” (114)? The Battle of Britain stands out as the lead turning point of the European Theatre of World War II. Like Stokesbury said, “Had Britain succumbed, it is difficult to see how the war against Hitler would ever have been won.” (p. 114). He also makes the case that while the Battle of Britain emboldened the United States to get involved, it was a victory won solely by the British. 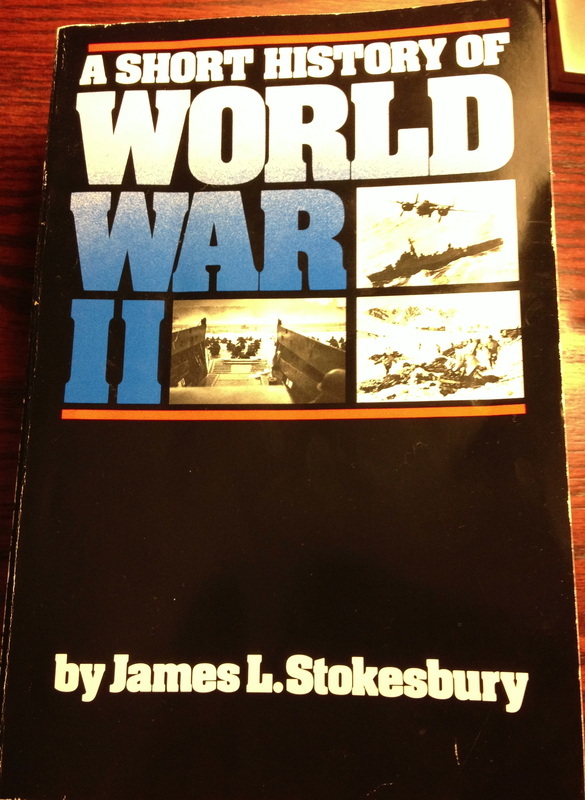 “Britain saved herself by her own efforts, not by future goodwill,” Stokesbury said (p. 114). Those efforts included bringing Londoners to their knees and compelling them to unite together to not just survive, but make their best attempt to carry-on. It also allowed the British to hit Berlin with bombs putting pressure on civilians and politicians in Hitler’s backyard. Stokesbury doesn’t come right out and say it, but Britain’s ability to hit Berlin emboldened the British as much as it demoralized the Germans. Not on a large scale, at least not yet, but it did a lot to prove the point that the British were strong and not being defeated. It’s hard to say you are winning when you have the enemy on the ropes and they still manage to land punches on your face. Much like in WWI where both sides wore each other out until new players arrived on the scene, the Battle of Britain bought enough time and allowed the allies to gather enough intelligence, for the United States to show up on the scene and be the game changer. 2. Why was Finland (and later Norway) a key territory for the Germans to control? Finland and Norway were major acquisitions for the Germans. By controlling them they were able to increase the flow of Swedish Iron ore, which was absolutely necessary to German industry and the creation of war materials. Also the German’s were able to with the taking of Finland and Norway destroy British and French moral with the crushing of the British Navy. This also allowed them to block the encroaching British naval blockade, thus setting them up for, as one could say, “smooth sailing” further on down the road. In addition to crushing enemy moral the Germans also were able to boost their own moral and allow their empire to appear larger and more impressive. 3. In Norway, how did air power trump sea power? When it came to the Winter War , the skies were key. The foggy coasts of Norway made Britain’s pride and joy, the Royal Navy, obsolete. The advancements made by Germany in aviation by the time of the Winter War made the large slow moving ships, easy targets because while the large ships were easily visible by German air craft the air crafts themselves were not as easily spotted through the cloud cover and were much harder to shoot back at resulting in the sinking of many ships. The significance of air power had up until this time been largely ignored and Britain had felt overly confident that her navy could win where ever it could float. This meant that aside from the initial significance of sinking several British ships and obtaining Finland, the psychological effects caused by this as well made it so that the German people themselves not only felt as though their air power trumped Britain but that they as a people trumped them as well. Is from page 103, ” After their delegation signed the surrender terms, Hitler danced his little victory jig outside the railway carriage and ordered that it be hauled off to Germany. He left the statue of Foch, but the plaque commemorating Germany’s surrender twenty-two years ago was blown up. ” I don’t know why but I don’t exactly see Hitler as the jig dancing type and I had to go back and reread this section to myself a few times before I was able to carry on I thought it was so funny! About the Normandy: Sacrifice for Freedom Albert H. Small Student & Teacher Institute in conjunction with National History Day and the National Endowment for the Humanities.